Jungle Red Writers: Debs on the Sound of Broken Glass. RHYS BOWEN: Today we Jungle Red Writers are dancing up and down and waving flags and tooting horns because the trade paperback of Deborah’s SOUND OF BROKEN GLASS is released to an eagerly waiting world. I was hooked on Debs’s books long before I met her. I loved the sense of place and the real, complex characters who people her books. So I thought I’d interview her today on Jungle Red. Okay, let’s get started—Debs, your stories all have such a strong sense of place. How do you work? Do you have a story idea and then decide where to set it, or do you discover a place and then think of a story to set there? DEBORAH CROMBIE: Rhys, no two books have ever been the same. In some books the setting has come first and I’ve come up with a story to fit. But THE SOUND OF BROKEN GLASS was just the opposite. I had had a story in mind for a couple of books but I didn’t know where it should be set. A friend, who was living in Crystal Palace at the time, kept telling me I should set a book there. When I went for a visit, I knew instantly that it was the perfect place for this particular story. RHYS: Crystal Palace figured in my childhood. I used to skate at Streatham ice rink and drove past Crystal Palace on the way there. I heard my grandmother’s tales of the crystal palace that burned down and was always sorry I couldn’t see it. So what drew you to set a book here? DEBS: Crystal Palace is such a unique part of London. It is the highest point between London and the south coast, so the views to the north of London and the Thames are spectacular. It’s geographically unique not only because of the elevation, but because it straddles the boundaries of five London boroughs, Bromley, Croydon, Lambeth, Southwark and Lewisham. Then there is the history of the palace itself. 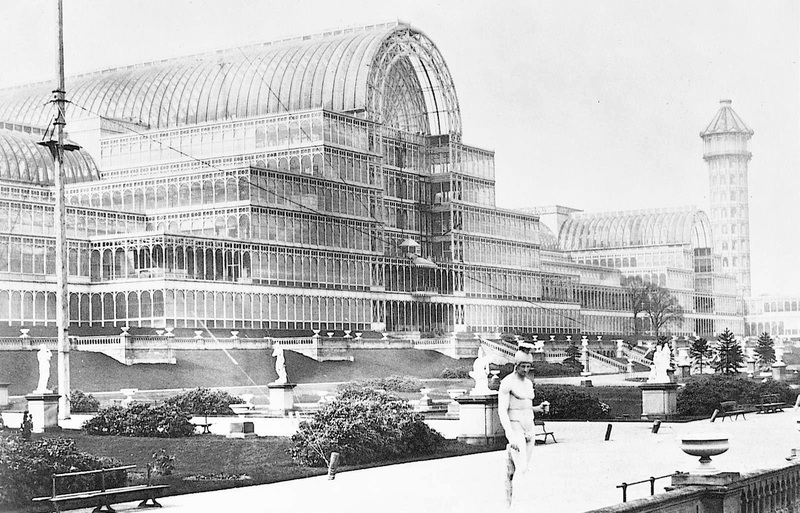 The original Crystal Palace was built in Hyde Park in 1851 for the Great Exhibition. Afterwards, the entire structure was dismantled and rebuilt at the top of Sydenham Hill. But the new version was even bigger and more spectacular—it was one of the wonders of the Victorian world, compared to the mythical palace of Kubla Khan. The palace was still a tourist attraction when it burned to the ground in one terrible night in 1936. The grounds then became Crystal Palace Park. The destruction of this fabulous creation was something that resonated with me throughout the novel. But there was one more element, and that is the isolation of the Crystal Palace Triangle (the main roads form a triangle at the top of the hill.) The two railway stations are both down steep sides of the hill, and if there is snow and ice, the area can become completely cut off. I knew there was a way an ice storm would fit into the story! RHYS: I love the way that minor characters from past books suddenly get a starring role. When you created Andy did you plan to have him feature in a story? DEBS: Andy Monahan first appears two books previously as a minor character, a talented rock guitarist in his late twenties, disenchanted with his band and his life. He was created as a witness who could tell Duncan and his partner Doug something about a murder victim. But the instant he walked onto the page and I started writing from his viewpoint, I knew he had a story to tell. When I visited Crystal Palace, I knew that was where Andy had grown up, and that what had happened to him there when he was thirteen would drive the front part of the story. RHYS: In this story Gemma is the active detective, Duncan is home baby-sitting. Tell us about this decision for a role reversal. DEBS: In the previous book, NO MARK UPON HER, Gemma is home on family leave, caring for the couple’s foster daughter, Charlotte. I thought turn about was fair play! Gemma has a new job in THE SOUND OF BROKEN GLASS, working on a murder team in South London (Brixton) with her colleague Melody Talbot. I wanted her investigation of the murder in Crystal Palace to have center stage, but there are things going on the background with Duncan that made his being away from work an important part of the plot. And it was an interesting way to explore his character. RHYS: I love the title (especially as broken glass only makes a sound when you walk over it). How did you come up with it. DEBS: There is an old rock song called I Love the Sound of Breaking Glass—a nice touch, since much of the book has to do with rock music. But the real metaphor for me was the destruction of the Crystal Palace and how that reverberated down through the years, paralleling the destruction of Andy’s friendship with his neighbor Nadine in the book and the consequences of their shattered relationship. That’s why the glass is already broken, but you can still hear the echoes. Made sense to me, anyway! RHYS: And we’re all eagerly awaiting the new Duncan and Gemma book in September. Can you give us a little glimpse into what’s coming? DEBS: It’s called TO DWELL IN DARKNESS, and we find out what happens to Duncan after the end of BROKEN GLASS. Gemma’s colleague Melody Talbot witnesses a young man burn to death in St. Pancras International Railway Station when Andy is giving a concert there. When it becomes Duncan’s investigation, Melody is a valuable witness. In Brixton, Gemma is working on a difficult case of her own. I don’t think I can say more than that without getting in trouble for spoilers! 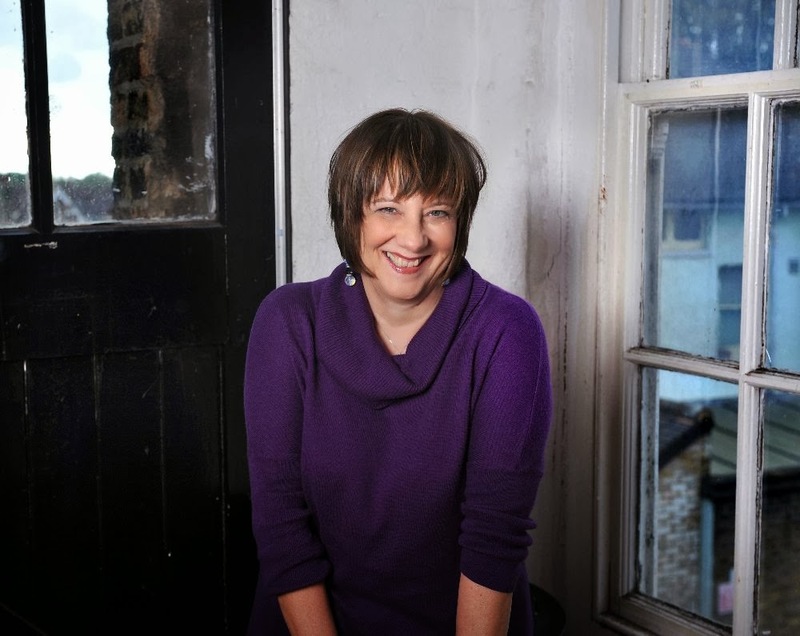 PS: The author photo included was taken by my friend Steve Ullathorne in Antenna Studios in Crystal Palace. Antenna Studios was the model for the fictional recording studio in the book. Lots of well-know recording artists have worked there, including Florence Welch of Florence and the Machine. Great atmosphere! RHYS: So if you missed The Sound of Broken Glass in harcover last year run, not walk, to your nearest bookstore. You are in for a treat! It's really interesting to learn about the history of the Crystal Palace and how it [and the Antenna Studios] related to the telling of Andy’s story . . . . I really enjoyed “The Sound of Broken Glass” and I can hardly wait to read “To Dwell in Darkness” to find out what happens next! Congratulations on the trade paperback release . . . .
Rhys and Debs, I love this interview. It's very interesting how you bring the Crystal Palace alive, an inanimate place that holds life until it is gone itself. Yet it lives in space and the community memory. Gemma and Duncan are my pals, of course. I loved the book and now hearing some of the background. I want to do a tour of London visiting all of Gemma and Duncan's places. Question: How do you promote the paperback version of your hardcover? Do you celebrate it like a new release? I'll be in that situation in May for the first time and am not quite sure how to treat it (with the second hardcover coming out a few weeks later). Thanks! I'm with Edith. I want a Deborah Crombie tour of the UK. I've used your books as a travelogue. I look up the locations on Google Earth and get a different perspective on the books. Some of my favorite locations have been Glastonbury and Southwark and Scotland and Henley. Aw, heck, I love them all! This is a great interview. Best of luck with the paperback release. I can't wait for the new release in September. Thank you for giving us Gemma and Duncan et al. Since your next book won't be out until September, I think I ought to start re-reading all the others. I first discovered your books at the library. (Now I buy them:-)I can't remember which one I picked up, but I could tell I would like it. Then I noticed it was part of a series, so I borrowed all the books that you had published up to that time, and just kept moving forward with your books and characters. It was such a delight to me to find you on JRW several years back! If I can ever get to London, I'm making a list of places you've written about that I MUST visit. I am sure I'll recognize them when I see them, simply from your descriptions! Debs, I read in hardcover, but so thrilled it's available in paper now. Hey, we and Rhys should do a Jungle Reds tour of the UK together! I have now assembled the first few books in the series and am eager to jump in. I read "Broken Glass" first -- I love the title. It is such an "alive" book -- you really took me there. I didn't know the crystal palace history -- so that was great -- but I love, love, love London. I read a book on Queen Victoria years ago that devoted a large portion to the Great Exhibition and the Crystal Palace. Fascinating place. More books for the every growing TBR pile. First-world problems, right? Good luck with the paper release! I just finished reading THE SOUND OF BROKEN GLASS for the panel I'm moderating at the Tucson Festival of Books. Like Deb's other books, I couldn't put this one down ... makes it hard to get my own work done :) I loved this interview because it's helping me cheat as I put together questions for the panel. Thanks for such great info, Deb! PS Susan, if you and Rhys and Deb tour the UK, will you need a roadie? Deb, I had never heard of the Crystal Palace until I read The Sound of Broken Glass. And that's how I recognized the name when I heard it on the finale of Downton Abbey! Carson mentioned it as a possible place for the staff outing in London. Great book and great interview - thanks to both of you! Oh yes, exactly what Karen said. I heard Carson say that and I thought, "I know all about Crystal Palace from Debs!" Best of luck with this release. I loved "The Sound of Broken Glass" and loved seeing you in SF when the hardcover was released. Even though no two of the books have been the same, there is a sameness about them that makes them seem familiar and makes you want to keep reading. It's like catching up with family. This family just has a little more excitement than most of us! What fun to have all my pals here today! And thanks for the great interview, Rhys! Reine, what a lovely description. I think it was that sense of the Crystal Palace living on in the space and in the community memory that drew me to it. I almost sent another photo for Rhys, one of great terraces that you can see in the photo from the past. Now it is just greensward, but the sphinxes remain. Very atmospheric. Edith, good question on the promotion. I did the Facebook chat with Louise Penny, the Goodreads chat with Rhys and the Todds. I'm doing a "blog tour" as the industry is calling it, meaning in the next few weeks I'll have close to twenty blogs up all over the internet. (And I've spent most of the last few weeks writing them.) A couple I've set up myself, like today and Mystery Lover's Kitchen last Sunday, but the rest have been organized by my publisher. There are some fun pieces; Pet Spotlight for Crimespree Magazine; a piece for the Sutter Home Vineyards Book Club (huge reach--even their FB page has over 400,000 followers,) a piece on how I Became a Guitar Groupie--but honestly, at this point it's hard to remember what I've written for whom... The book is an Indie Pick for March. And I'm doing some conferences and events (Tucson Festival of Books, Left Coast Crime, a library event in Longbeach) and although I didn't plan these to promote the book, it will be nice. Harper Collins has arranged a Twitter Takeover on Friday--not sure what that means but I guess I'll find out! Yes, I think Rhys, Susan, and I need to do an event in England, at least. And of course we should have roadies! Oh! A Deborah Crombie tour of London - YES! I love that idea. I've been a fan of Gemma and Duncan's since I discovered them many, many moons ago. I now becoming a fan of Andy and Melodie's. 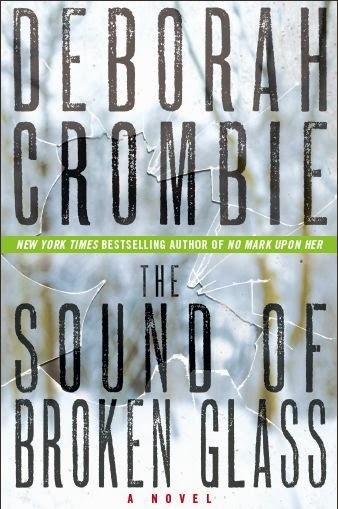 Loved "The Sound of Broken Glass," and am tapping my toe impatiently awaiting the next. I hope you continue writing this series for years and years and years - it is as fresh now as it was in the beginning. AND, I am very much looking forward to having you at Meanderings and Muses on 3/16! Me, too, Kaye! Now I wonder what on earth I can talk about after twenty blogs... Not to worry, I'm sure I'll think of something:-) And I love being on M&M because it's just like chatting to a friend. I volunteer to be a roadie! Yay Debs!! Ooh, one of the blog posts I've done is on eating (and drinking) my way through Portobello Market. That, I think, is my favorite! I'm going to London mid-May--can't wait!!! Great interview! Rhys, your particular points about Debs' books mirror mine. Nobody does sense of place better than you, Debs, and the reappearance of minor characters from previous books is something I, too, love. The Sound of Broken Glass was such a fantastic book, and the history of Crystal Palace is fascinating. Since reading the book, I've come across Crystal Palace mentioned in some other books, and I'm always so excited because of first learning of it in Debs' book. And, yes, the mention of this location in Downton Abbey was such a thrill. So, congratulations on the trade paperback edition of your wonderful book, Debs. I am tempted to buy it, even though I have a lovely signed hardback. I am waiting anxiously for To Dwell in Darkness to find out what's going on with Duncan at work. I have been a fan of Deborah Crombie's books for several years now. I had finished all of Colin Dexter's Morse books, and I was anxious to start a new series. A friend recommended Deborah's series, and I've been hooked ever since. Congrats on the trade paperback release! Oh boy am I way behind. I read various Gemma and Duncan books hit or miss style, out of order. I have to find time to read them all in order. My TBR pile is teetering right now. Aw, such problems to have, right? Anyway, congratulations Deb and I am waiting for a JRW tour. I've already read it in hard cover, because I couldn't wait, but congrats on the paperback.I'll be looking for the next one. Crystal Palace... just imagining how spectacular it must have been. The size alone. Congrats on the paperback - loved the book, too. Fantastic characters. I highly recommend a visit to Cyrstal Palace Park if ever you are in London on a NICE DAY. (Crystal Palace is famous for its extreme weather and when it is cold, it is very very cold.) The park is beautiful and that's the only way you can really get a sense of how immense the structure was. And the fire was seen from (if I remember my facts) five counties. It must have been a terrible and horrifying spectacle. So sad.